Stump Pond is known mostly to be a fishing spot. The state owned property however has a short out and back trail that follows the shore of the pond. Starting from the parking area, you can first walk along the dam to the left to catch a sweeping view of the pond. At the end of the walkway is the spillway where Stump Pond (also called Stillwater Reservoir) flows into the Woonasquatucket River. From here retrace your steps and continue to follow the dam towards the woods. A well defined trail then follows the shore winding gently up and down small hills. The trail comes to a small peninsula where there is a cluster of trees leaning over the ponds edge. A trail ahead continues onto private property. For this hike, stop at the small peninsula and enjoy the view before returning back to the parking area. Yesteryear there existed a cluster of buildings in the woods of what is now Smithfield. This town was in an extremely remote area miles from any other towns or villages. The town was eventually abandoned and all that remains are several cellar holes, wells, and stone walls. It is known as Hanton City and there are several theories of why the town existed in the first place. Some believe that maybe the occupants were loyalists to the British throne during the American Revolution, others believe that maybe these occupants were diseased and forced to live away from the general public. Regardless, they had a small but fully functioning village in the remote woods of Northern Rhode Island. The properties in the area are owned by several different groups. Some of it is privately owned, some owned by nearby Fidelity. The rest is owned by the Audubon Society and the Smithfield Land Trust. The area is not open to the public and access is available occasionally when the Smithfield Land Trust leads guided group tours of the property. A short trail system indeed, Mowry Farm offers quite a bit variety and is a nice supplement to the nearby Mowry Conservation Area. Parking is available at the community gardens along Farnum Pike. The trail (red trail on the map) at the extreme right end of the parking lot passes a fenced in garden and greenhouse before coming to a sign indicating the trails are to the left. First you will pass an open grass area with some scattered art work including the roundhouse and cob oven. It looks like “Stickhenge”. Just beyond that the trail leads into the woods. For this hike continue straight onto the yellow blazed trail. Here some very large trees have been cut down. Their trunks are being carved into unique chairs and benches. The next feature along the yellow trail is the tree fort type of structure overlooks the land below. Continuing downhill the trail crosses the red blazed trail then crosses the upper reaches of the Woonasquatucket River via a footbridge. 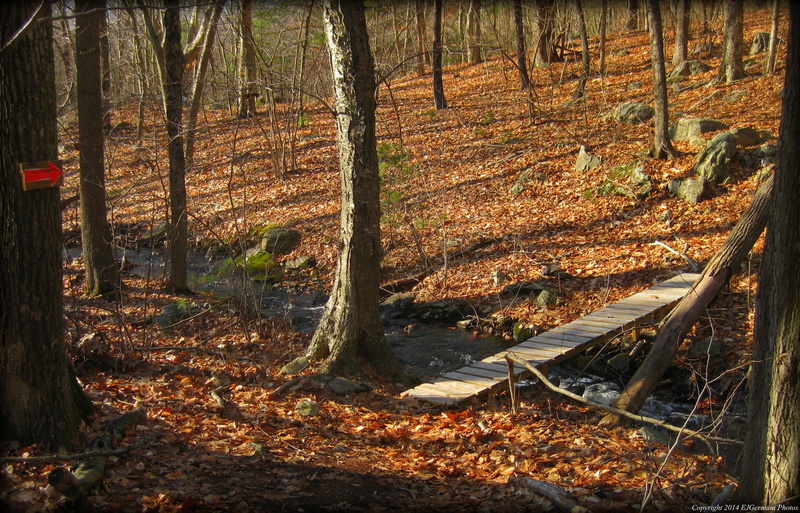 The yellow trail ends at a large rock that overlooks the northern end of Stump Pond. From here retrace your steps back over the bridge then turn left onto the red trail. At the next intersection turn right and follow the mowed path pass the chicken coups. Soon you will reach the trail that you entered the property on. Retrace your steps back to the parking area. Deerfield Park has a little of everything. It is used mostly for its athletic fields. It is also where the Smithfield Senior Center is located. I started this walk from the second parking lot by the playground. Directly across the street is a walking path flanked by rail fences. It leads away from the road and into the woods. The path turns into a trail which eventually comes out to a ball field behind the Gallagher Middle School. From here I stayed to the right keeping the woods to my right and made my way to the front of the school. At the front of the school I turned right and crossed the pedestrian bridge to the Smithfield High School property. Again I turned right keeping the woods to my right and continued walking behind the High School and to another ball field. I soon found another walking path on the right that would cross the Stillwater River and lead back to Deerfield Park. The walk so far is just under a mile. From here I crossed the street again and went right following the walking path, passing the playground, and eventually coming to a side street. At the side street I turned left toward the soccer fields. Across from the soccer fields is the entrance to another short set of trails named for R. Bruce Ewart. The trail soon comes to an opening. Ahead the trail leads to a residential neighborhood. I followed the trail to the right which led me to the Senior Center. From here I followed the road to the right back towards the car passing the Smithfield Veterans Memorial. This Smithfield Land Trust property has just been recently blazed and mapped by members of the Rhode Island Land Trust Council. The green trail starts at a small parking area along Ridge Road. We followed the green trail into the property until we reached the orange loop trail. 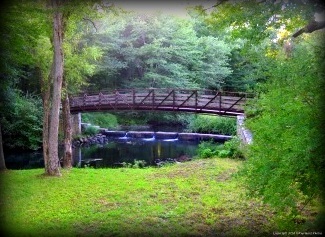 The loop trail crosses a babbling brook twice on some new wooden bridges. After doing the loop we retraced our steps back out to the parking area. The property, small and wedged between two neighborhoods, is a rather pristine spot and a great addition to the Smithfield Land Trust trails. Trail map can be found at: Olivias Forest. 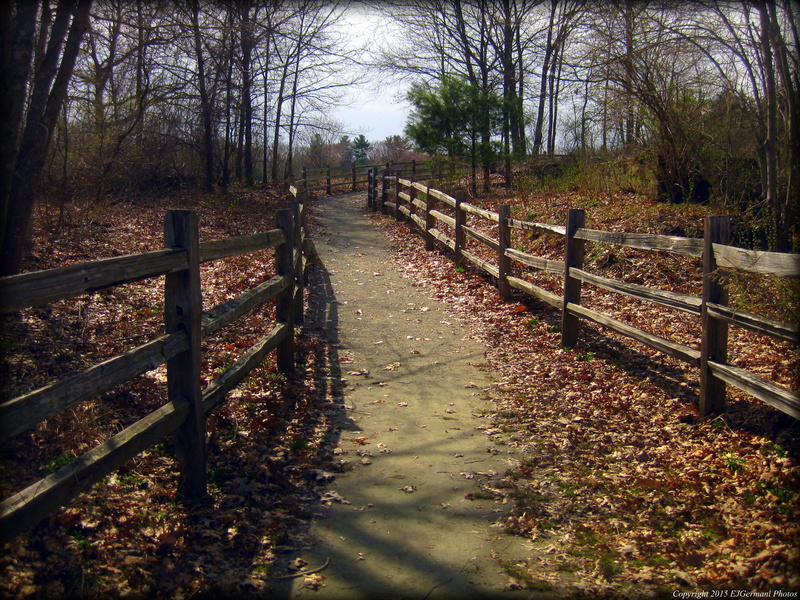 Esmond Park is a combination of a short trail on a former railroad bed and a small town park. The two distinctly different parts are separated by an arch bridge that crosses the river at a small waterfall. The park itself, complete with World War I monuments, paved paths, and park benches is at the corner of Farnum Pike and Esmond Street. The parking area is a little further north along Farnum Pike at the end with the trail entrance. I came across a few people walking dogs here. Trail map can be found at: Esmond Park.